When news broke that Willow Smith turned down this Annie remake (that had been setup as a starring vehicle for her), I pretty much thought they would scrap the project. But then they signed Quvenzhané Wallis for the starring role, and the project seemed to have new life. Now that we are finally seeing the film’s trailer, I couldn’t be more happy that they decided to push the production through. 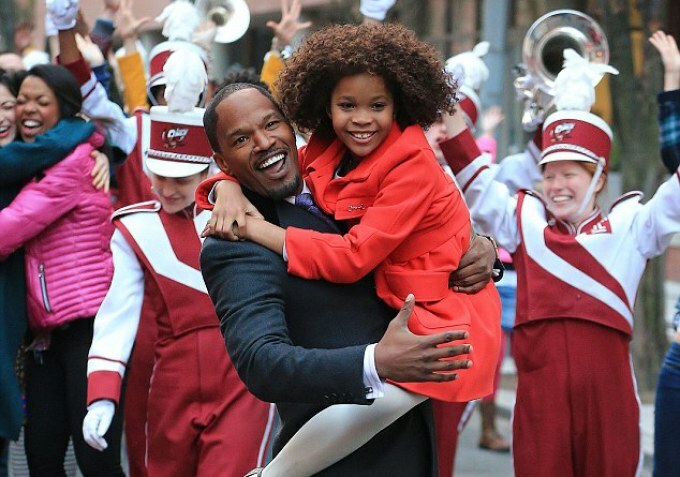 Quvenzhané Wallis stars as the titular Annie in this remake of the Broadway and film classic. This is a modern take though, refreshing the well-worn songs and adding a bit of “color” to the characters. This movie stands poised to offer an alternate version of a story for minorities, just as The Wiz did for The Wizard of Oz. Daddy Warbucks is now Will Stacks, played by Jamie Foxx, a candidate for mayor that needs some help with his public image. Cameron Diaz’s Ms. Hannigan brings the same stank that Carol Burnett did in the prior film, but her dialogue is decidedly more current. And Quvenzhané Wallis lightens up on-screen, bringing the trademark joy Annie is known for. The movie is due in theatres this Christmas. How you feel about a black Annie? Watch the trailer below and share your opinion in the comments section below!